Whether in tragic or comic ways, error imitates truth, and real Theosophy has always been surrounded by a host of often brilliant or spectacular forms of pseudo-theosophy. One significant example of this occult law can be found in the creation of a theosophical cult around the personality of Jiddu Krishnamurti (1895-1986). Even now the Krishnamurtian creed subsists, although in a rather quiet way, and Mrs. Radha Burnier – the president of the Adyar Theosophical Society since 1980 – is one of its staunchest leaders. Krishnamurti was 14 years old when he was “discovered” in Adyar by C.W. Leadbeater. By then, both Annie Besant and Leadbeater used to have long imaginary conversations with some “Lord Christ”. Soon after the discovery, the boy was officially presented to the world as being a high initiate and future avatar – the vehicle for the second coming of the Lord himself. Deeply surprised, Subrahmanyam related the dialogue to his close friend Wood. “Bad news run fast”, according to a popular saying. As soon as Mrs. Annie Besant was informed of the fact, she called Subrahmanyam to her presidential office. 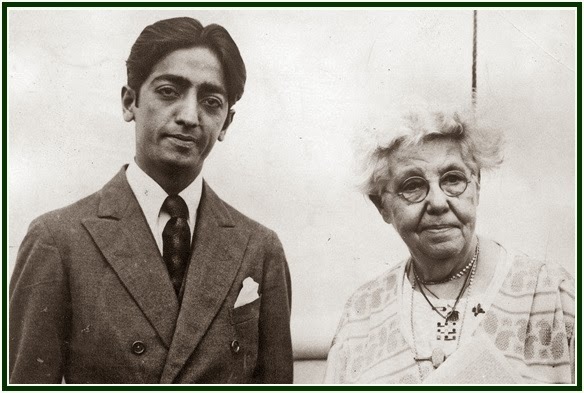 Mrs. Besant told him that it was simply “not possible” that Krishnamurti had ever said such a thing. She then presented Subrahmanyam with the alternative of “immediate recantation – or banishment from Adyar”. The Master thus explains that Adepts can hardly get near persons who believe in superstitions like “God or Gods”. The deep contrast between the two viewpoints can be explained by the fact that C.W. Leadbeater – Krishnamurti’s teacher – had failed in discipleship soon after being put on probation in the 1880s. As a result, he was never admitted to HPB’s Esoteric School, as long as she lived. “Totem and Taboo – Resemblances Between the Psychic Lives of Savages and Neurotics”, by Sigmund Freud, Dover Thrift Editions, Dover Publications, Inc., Mineola, New York, USA, 1998, 138 pp., see p. 25.